Oil exploration on the Blackfeet Indian Reservation, bordering Glacier National Park's east side, is rapidly expanding. The decision to explore and drill for oil was made by the Blackfeet Nation and the Blackfeet Business Council. I respect the Tribe’s right to use its resources and earn income from selling them. I’m asking you to help support my documentary project. Let me explain, and show you what's going on through my project. 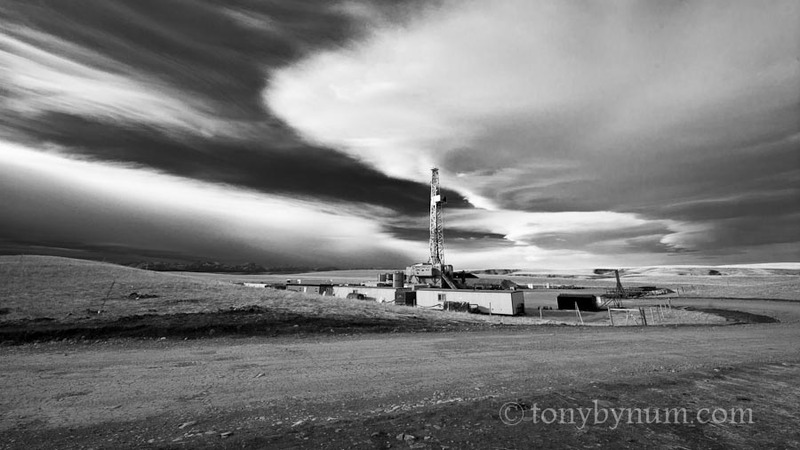 I have been documenting the oil exploration on the Rocky Mountain Front for over two years now. I have photographs of oil drilling and videos of drilling mapped and online. Drill rig drilling just above the Two Medicine River south of Browning, Montana. Glacier National Park is in the distance just left of the drill tower. © tony bynum, all rights reserved. In the past two years over 30 new exploratory wells have been drilled on the Blackfeet Indian Reservation. A few have been drilled within a few miles of Glacier National Park on the east side. I have heard estimates ranging from 80 to 100 wells along the western edge of the reservation, the area closest to Glacier Park, for full field development. Currently, each well undergoes an Environmental Assessment (EA) on a per well basis. There is no comprehensive analysis of the potential impacts to the social, economic, or environment from full field development. In other words, there is no Environmental Impact Statement in which to analyze cumulative impacts. Therefore, there is little information available to anyone about what the future might look like. Moreover, it’s only now, after more than 30 wells have been drilled that people are becoming engaged. To my knowledge, there has not been an industry or tribal sponsored public meeting or public hearing to discuss oil drilling on the Reservation. The only information we get is though EA's and a few public, and state sponsored discussions. The EA's are made available at a location in Browning, MT. No one is sure what full development will look like, or if it will even occur. We do know that there are about 40 more wells planned over the next year for a total of 70. We really are due a more comprehensive study of the potential impacts. Native american sculptures designed and crafted by Darrel Norman, owner of the Lodgepole Gallery and Tipi Village located just west of Browning, MT, and a drill rig tower. © tony bynum, all rights reserved. Buffalo graze in a pasture, next to an active oil well, east of East Glacier Park Montana, about 4 miles from glacier National Park, the Badger Two Medicine is in the background. © tony bynum, all rights reserved. If the oil exploration involved only a few oil wells that would be one thing, but it's not. This is about a complete overhaul and industrialization of our landscape as we know it. An EIS would help us look at the potential impacts of full scale production and build out - which some have said could include as many as 800 wells in the next 10 years across the entire Blackfeet Reservation - with about 100 of those being within the grizzly bear recovery zone, (basically the area west of the Duck Lake Road) and the area closest to Glacier National Park. Even with all of that in mind, I remain optimistic. The Blackfeet People have been here a long time. They also have a right to develop their resources, but what alarms me is that if history repeats itself, and I have no reason to believe it won't, this boom and bust cycle will once again play out along the Rocky Mountain Front, and the border of Glacier National Park, just as it has all over the world. The resources will be drained, the people will be left to deal with the legacy by people whose only goal was to make money. Let me be clear, money is not bad. However, the people who stand to make most of it, do not have a stake in the future of this landscape no more than a barber cares about the future of the hair he takes off the top of my balding head. When the oil is gone, the industrialized landscape created, what will our future here be? Is there a chance that a more long term and economically sound decision could have been made? Well, lets see. All indications and proof are that the answer is most certainly “yes!” Wildlands are at a premium today, and rising, and as far as I can tell, we're not making more of it. Might it be a better for the long-term to embrace the land and the potential economic rewards associated with limited extractive use over drilling, roading, and polluting the things that people come here and spend money to see - the mountains, the wildlife, the fish, the culture, and the open spaces? If we foul this nest what's next? What is left on the table for an economy here in Blackfeet Country? We need to answer that question now because at the current rate of development, we will need to take action to implement that plan very soon. A wise man once gave me sage advice. When thinking long term about resources management decisions, we should always consider the consequences of our actions and what they mean for future generations. There are limits to what we can do today. The principle goes like this, we should, in the very least consider alternatives that allow future generations at least as many options as we had. As far as I can tell, industrializing a landscape removes the one option that has, for this place, the biggest potential for long term economic rewards. Open spaces, wildlife, and recreation. The fact is, everything is connected to everything else. What we do "here" impacts what happens over "there." Wise decision making should include thinking about, and acting upon the known needs of future generations. In a nutshell, we must be sure that we understand, as best we can, what impacts today's actions will have on the ability of future generations to chart their own future and the more options they have on the table, the more likely they will be to succeed and prosper. It’s as easy as saying, if we pollute our wild trout streams to the point that wild trout can no longer live in the water, there is no option for wild trout on the menu, or to catch for fun. If we take options off the table, future generations are limited to what is available to them at the time. In a world of limited resources, some of which cannot be replaced in a lifetime or even 100, if we take away the opportunity to use the land for its wild character we eliminate the option to cater to those that demand and pay dearly to experience such settings. Open spaces, clean air, unobstructed vistas, and silence are among those that would be off the table. I am not talking about creating a wilderness. I am talking about using the landscape in its current state in order for it to continue to provide the same, and maybe more benefits for the next 500 years. In closing I'd like you visit my website and look at the images, some of wide open areas and some of oil exploration, and watch the videos of the oil development on the Blackfeet Reservation. The goal of my project is first to educate, and second to build a visual record of the land before, during and after the dismantling of one of earth's most unique and coveted places. My hope is that this record can be used by future generations to help them put the land back together. 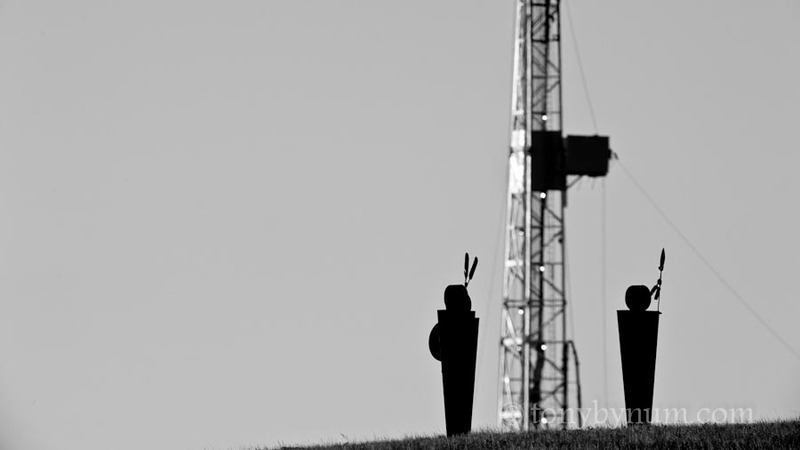 This is the third year of my documentary project on “Oil Drilling on the Rocky Mountain Front, Blackfeet Indian Reservation.” Please consider a donation, or a sponsorship. So far I've have raised, through donations, about 20% of the cost of this project to date. 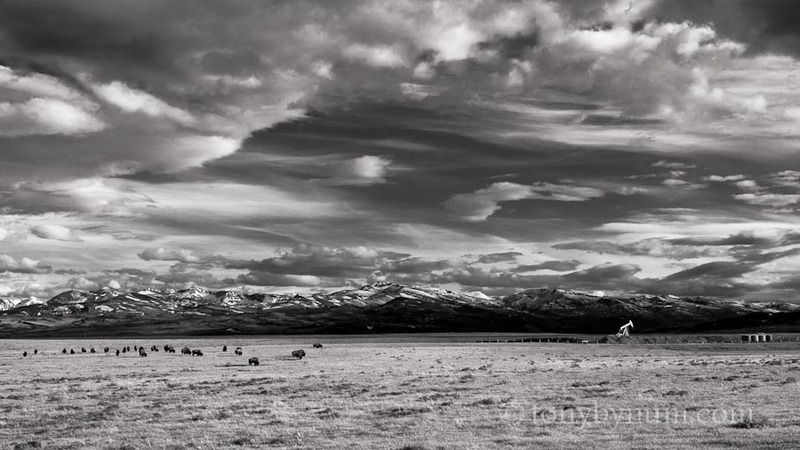 Any donation will go a long way to help offset the costs of documenting and reporting on the oil development along the Rocky Mountain Front and Blackfeet Reservation. You can make a secure, private donation below the oil drilling map of the reservation on this page. Or you can mail it to me, Tony Bynum @ PO Box 441 East Glacier Park, MT 59434. Please share this blog post with anyone you think cares about the Blackfeet Reservation, the Northern Rocky Mountain Ecosystem in Montana, Glacier National Park, the Crown of the Continent, or trout streams and kids. Thank you for taking the time to read this, and for commenting. I have never seen a post-oil extraction site left in as good or better condition than what it was prior to oil companies taking an "interest" in it. On the contrary, the land always seems to be left in an appalling state, with no regard to its long term citizens, wildlife included. To allow oil companies anywhere near such a pristine and fragile environment as GNP is short-sighted at best, and most likely driven only by greed. Go away Big Oil; you've already ruined too many beautiful places.